We released new feature of “Vendor Management” in ApnaComplex today. Starting today, Administrators can maintain the list of all vendors that association and apartment residents use in a central place. Details like vendor name, services offered, address, contacts and other details of vendors can be collected and made available for all the residents. This makes it easy for all owners/residents to know the details and also immensely helps for new comers into the complex who would typically need all contacts as they settle down in their new house. What’s more – the owners/residents can provide feedback about the services offered by the vendor and rate them on a scale of 1 to 7. We hope this helps to maintain the feedback about a vendor in a central place and also providing a forum for managing committees to take feedback from owners/residents on Vendors before they decide on renewing contracts with the vendors. Associations can now take informed decisions when deciding on a vendor and also provide more transparency to all residents of the apartment complex. Wait! There’s more to this – the administrator can decide to mark the vendor details as “public”. Vendors marked as “public” will get listed on the complex’s home page along with the feedback and ratings by the members. This will be visible to everyone on the internet who views your complex’s home page (others on internet can only see the vendor details and ratings provided by the members of the complex, they will not be add their feedback or rating). Thus you can share your experiences with a vendor with other associations and learn theirs as well. In addition to vendor management, we have made subtle enhancements to our user interface to enhance you experience when using ApnaComplex. We sure hope to have made life little better for you! If you are considering using ApnaComplex for your association, please submit details of your complex here and we would reach out to you to set up your complex’s portal online. An instance would be the time you missed an important society meeting simply because someone forgot to inform you about it! There might also have been occasions when you may have wanted to make a complaint or request permission to hold a function but just didn’t get the time to write to the Managing Committee. Or maybe you wanted to share an important announcement with your fellow residents but couldn’t get the approval of your Committee in time. Then of course there are those notices lost in transit, misplaced bill receipts, minutes of the meeting that didn’t reach you and so on. These are just a few of the many small but significant issues that leave you with a feeling that things could be so much better if only there was a more efficient way of handling them! Now that we’ve listed the benefits, let’s take a quick look at how ApnaComplex actually makes them possible. The speed and connectivity of an online platform ensures that you can connect from anywhere, anytime to carry out all your correspondences and get updated on all activities in your complex. Our focus on usability ensures that you spend the minimal amount of time on carrying out any activity: from responding to an email to posting an ad to checking your bill payments. A Dashboard view ensures that all your transactions and communications can be accessed easily and quickly. You can also save time and energy by booking your clubhouse facilities, library and other services online through ApnaComplex. Consolidated view to a member of all activities in the complex. With ApnaComplex, you can communicate with people within or outside your complex without revealing your email address. This ensures that while you are able to send and receive mails, your email id remains private until you choose to reveal it. Others can also contact you directly without having to know your email id. Your data is 100% secure even while transit. The entire portal is SSL enabled – which means peace of mind. You can receive important information such as your maintenance dues, emergency repair schedules, association meetings, etc. directly from committee members by email/sms. 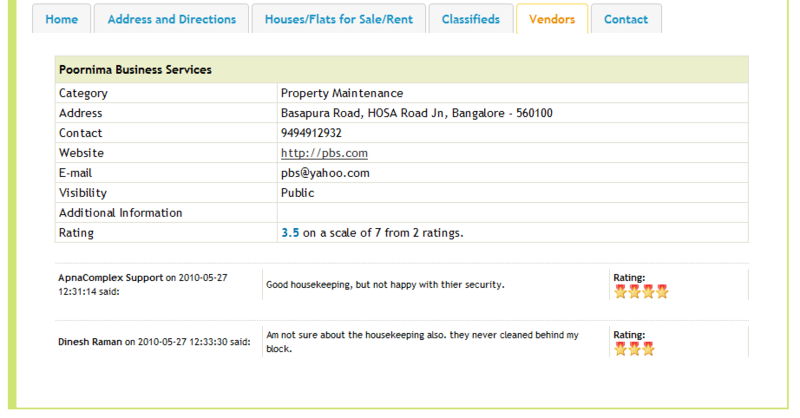 You can raise, view, track complaints related to your house in one place. If you mange more than one house – whether within the same complex or outside – you can manage all activities using ApnaComplex in an integrated way. You can view the directory of all members as well as know the members on your Managing Committee and communicate with them. If you want to offer your house for sale/rent, you can simply put up an online classified ad in ApnaComplex that will be made available on the Internet. This ad can be accessed by people both within and outside the complex. This way, you not only save on the effort required to post your ad on various online sites you also save on hefty brokerage fees as you can get in direct touch with the lessee or buyer. You can enter payments made to your association online and get confirmation on validation by the Treasurer. You can view a consolidated statement of all the charges and payments made for all the houses you own. You can view as well as download receipts in PDF format for the payments you made, any time (did we hear a sigh of relief from the Treasurer there?). You can see how the money is being spent on the complex maintenance with help of expense statement that Treasurers can publish every month. You can publish notices online that will reach all other members. You can communicate with other members in your complex about upcoming events, meetings, and any other activity without having to know their email ids. You can know and reach your managing committee members through our secure messaging feature. This is just the beginning of what we’ve in plans for you. We are currently focusing on getting more information about local businesses and services at your fingertips and many more such features that offers you a little more convinience. We’ll keep you posted on the developments. In the meanwhile please let us have your feedback on the features currently on offer. Good, bad or ugly – we’d love to hear from you. 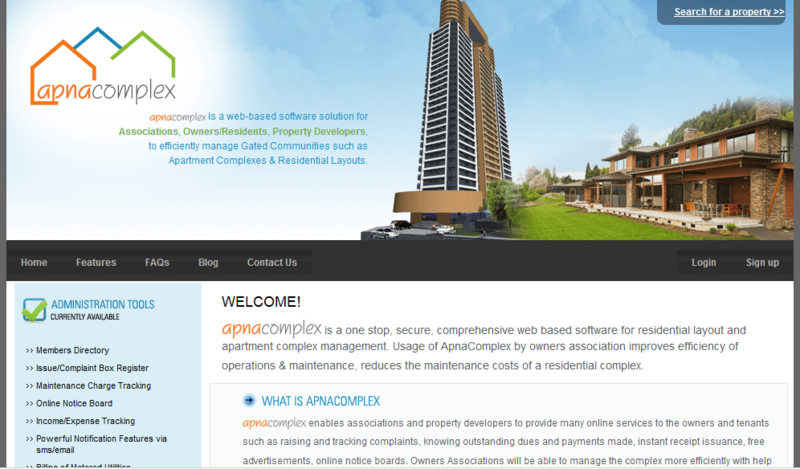 We’d also appreciate any ideas on features and functionality that will make ApnaComplex more useful for you. So please feel free to get in touch with us with your thoughts and comments. You can contact us here. So, what are you waiting for? Register yourself and your complex. Now. ApnaComplex welcomes RM Sneha Residency! RM Sneha Residency – a mid-sized apartment complex have decided to manage thier community and maintenance activities on apnacomplex.com. We thank them for chosing ApnaComplex and proudly welcome them!